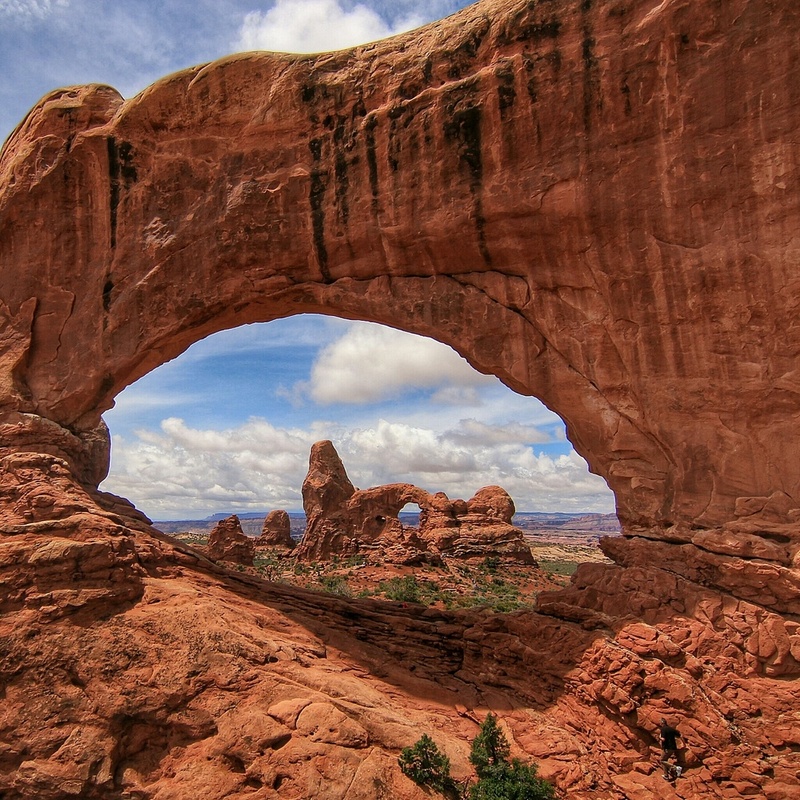 Located in Moab, Utah and home to over 2,000 unique arches makes this park different from any park in the world. I'd recommend getting an early start as possible. Arches has tripled visitors the last few years so lines are already starting at 8-9 am in the busy season April-October, but really when isn't it busy anymore? Try and get there by at least 9 am to avoid huge lines. If you're an early bird and like greeting the sun in a spectacular location, start off your day at the North & South Window Arches (right past Balanced Rock about 10 minutes after the entrance ) There you can take your pick of if you'd like to spend it at Double Arch, North Window, South Window, or Turret Arch to watch the sun slowly rise over La Sal Mountains and warm up the red sandstone. Afterwards grab some breakfast (bring lots of snacks, a couple meals, and alot of Water) and head further into the park towards Delicate Arch Trail head but turn off on The Devils Garden Loop Exit. Here you can see up to 10 different arches on an 8 mile jaunt. This hike may wear newer hikers for the day but if you have the energy after resting a few hours from this hike, try and get to the infamous Delicate Arch Trail, Arches most popular hike for an always beautiful sunset. Catching a sunrise or sunset at the infamous "Delicate Arch” is a must do while in Arches Nat. Park. Fun Fact if you aren’t from Utah, its the Arch on most Utah vehicles plates. If you make it the end of the this hike to see Dark Angel Arch or Private Arch, you will be hiking around 8 miles round trip and could've seen over 10 arches on that one hike. Personally this is one of my favorite hikes in Arches due to Delicate being overcrowded and not many trails in the park that are very long. My favorite Arches on this trail were Navajo Arch, Pine Arch, and Double O Arch. I would suggest bringing a lunch and plenty of water so you can take your time and enjoy each special arch. There is lots to see on this trail and you will most likely want to stop frequently (especially if you like taking photos) I would also HIGHLY recommend starting your hike by 8 or 9 a.m. at the very latest. By 10 o'clock all the buses and tourist show up and can become almost as crowded as Delicate Arch. Description: Devils Garden Loop is a 8 mile loop trail located near Moab, Utah that offers scenic views and is good for all skill levels. The trail is primarily used for hiking & snowshoeing and is accessible from February until December. One of my favorite images i've captured in the desert. Turret Arch, looking through the South Window Arch. This is why I highly recommend anyone new to Arches that may not have alot of time or the right equipment for a full day adventure. You can see Balanced Rock, Double Arch, The Windows Arches, and Turret Arch in just a couple hours only traveling a mile or 2. One of the most spectacular sights in Arches National Park, Double Arch displays two huge arches intertwined in what looks like a gyroscope. The relatively flat, sandy trail heads to the base of the two giant arch spans. The arch grows bigger and bigger the closer you get, and you can climb high inside to the far window to look west. The spans are massive and the arch shows signs of collapse as boulders are strewn about underneath. From the vantage point in the window of Double Arch, the Windows and Turret Arch appear quite distant. The Parade of Elephants is viewed to the east the rocks look just like a bunch of elephants on parade. 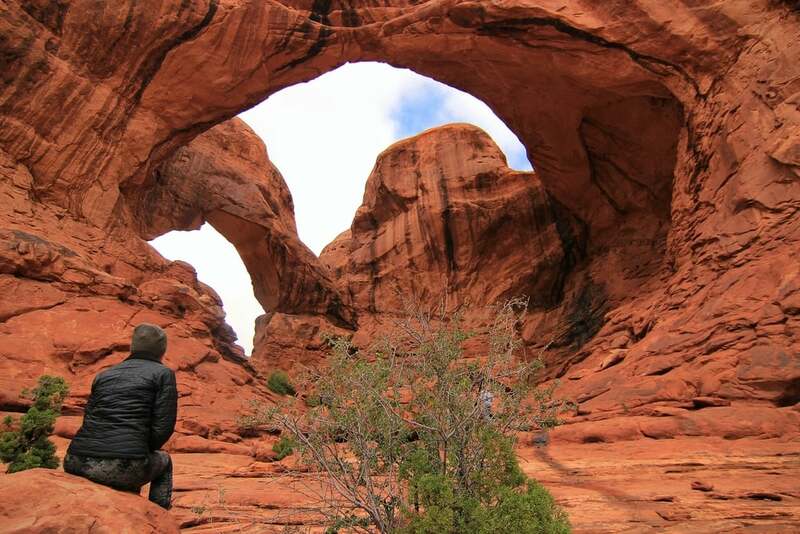 Windows Primitive Loop is a 1.2 mile loop trail located just west of Double Arch that offers scenic views and is good for all skill levels. The trail is primarily used for hiking & snowshoeing and is accessible year-round. 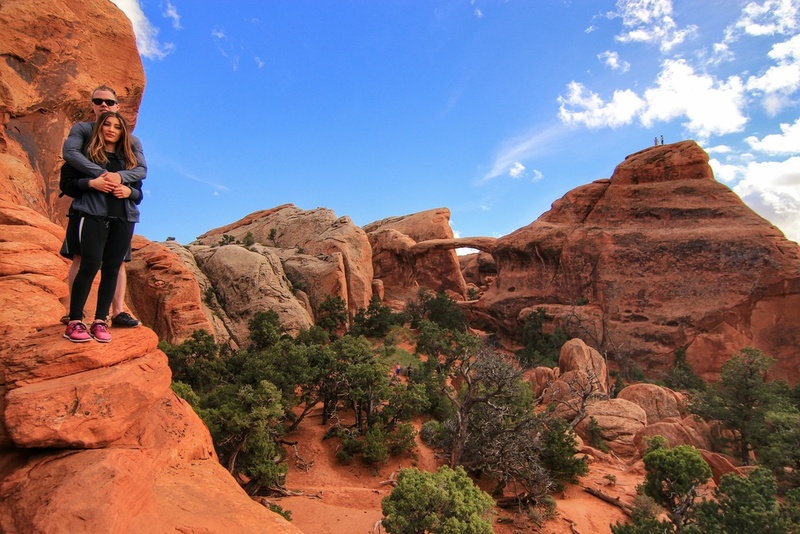 Description: Landscape Arch Trail is a 2 mile loop trail. It is one of several arches on the Devils Garden Loop (shown with pictures above) and is good for all skill levels. The trail is primarily used for hiking and is accessible year-round.